Home > Business Aviation > Vertical Flight > Does Patent Application Reveal Bell’s eVTOL Design? Does Patent Application Reveal Bell’s eVTOL Design? Register now for free access to "Does Patent Application Reveal Bell’s eVTOL Design?" and other premium content selected daily by our editors. 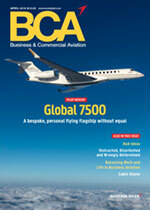 The cornerstone of Aviation Week’s business aviation portfolio. Business & Commercial Aviation is the industry’s most reliable "how-to" source for business aviation intelligence.